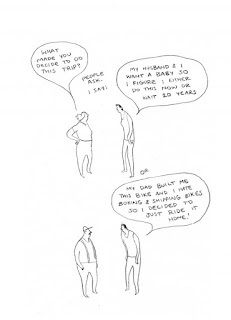 You & A Bike & A Road is a deceptively simple looking book that actually delves into multiple, complex areas of life. It is a travelogue of a bike trip planned from Arizona to Georgia. It is a portrait of a person dealing with the demands of life and dealing with depression. It is a commentary on the current state of immigration along the southern border of the US. It is an existential exploration of what it means to be a person on a journey. And it is also a portrayal of the interesting, generous, and memorable people she meets on her trip. Perhaps the most impressive aspect of the book is its economy of linework and storytelling. The art is that best kind of scribbling, what seems like rough pencil lines that are actually very evocative and full of energy and import. And the story is full of small moments and observations that can easily be applied to larger life topics and situations. I rate this book alongside some of the best ones I have read in recent times, like those by Jules Feiffer and Pénélope Bagieu. Even with a similarity in terms of the amount of craft and artistry put into it, this book is still in a category of its own. Of late, I have been on a tear of books by this book's creator, Eleanor Davis. She has racked up quite a few accolades, including the Russ Manning Most Promising Newcomer Award, and has created a number of books that can appeal to adults (How to Be Happy), younger readers (Stinky), and adolescents (The Secret Science Alliance). I have read a couple of very good interviews about her work on this book, and you can read them here and here. All of the reviews I have read have been full of accolades. 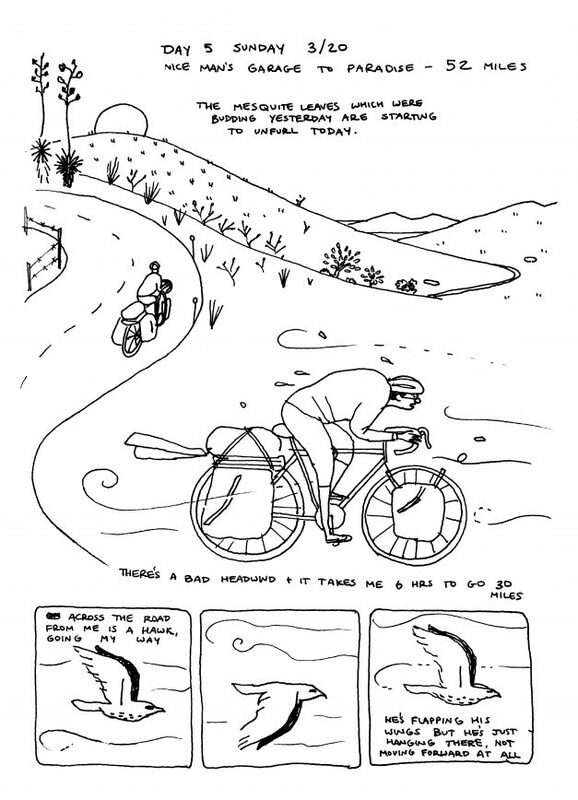 Sarah Miller wrote, "Even though You & A Bike & A Road is made up of moments that seem self-contained as we read them, Davis’s work—intentionally or unintentionally—comes together to form an overarching narrative that raises questions about identity as much as it comforts through its depiction of overcoming challenges." Oliver Sava praised her "phenomenal work capturing the sprawl of the Southern states, starting with the deserts of Arizona and New Mexico before moving into more fertile territory." 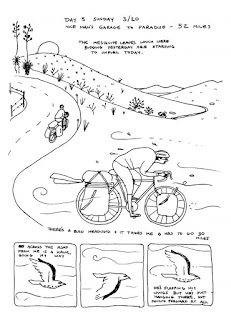 Ally Russell called it "a remarkable achievement for both the cartoonist and the amateur cyclist behind it." 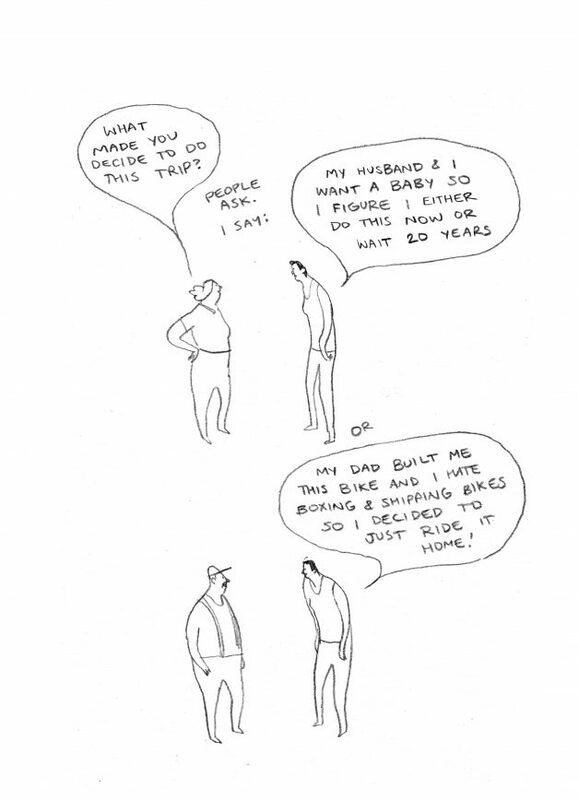 And like Nicole Rudick wrote, I am also "in awe of Eleanor Davis’s drawings." You & A Bike & A Road was published by Koyama Press, and they have a preview and more about it here. I reviewed another volume of Manga Math Mysteries in the past, and I liked it pretty well. 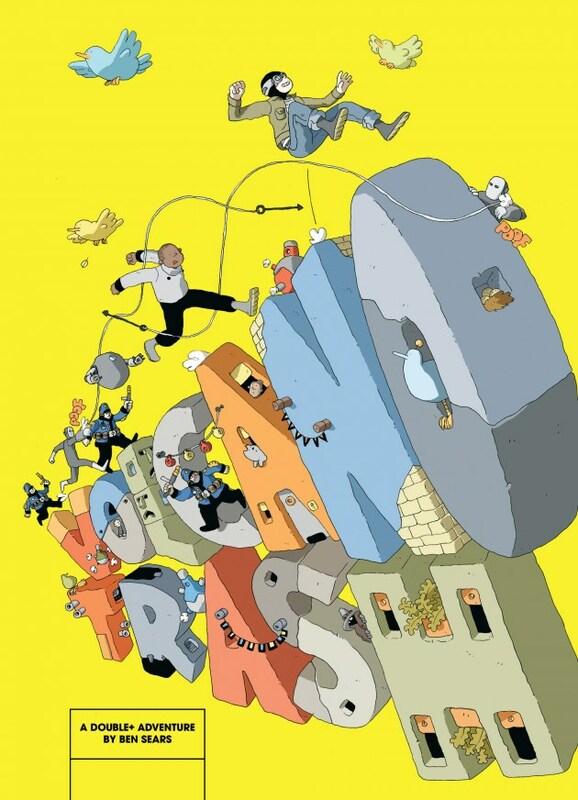 As I am always looking for the rare unicorn that is a relevant, actually enjoyable mathematics graphic novel, I thought I would check in with another volume in the series. The Runaway Puppy is much like The Secret Ghost in that best thing about this book is the expressive, clear, and fun artwork. It also stars the same bunch of good friends united by school and martial arts classes, which is a plus if you are dealing with a young reader who digs series books. The story, about a puppy who gets out of the yard (it's sort of in the title) and how the gang use probability to figure out her is pretty solid, if a little didactic. Still, the story has some good points. The examples might get a bit repetitive, but I appreciated how this book used them in contrast to show how probability works and how odds are not just cut-and-dried eventualities that always play out in uniform manner. This characteristic could be very helpful in spelling out math concepts to a learner. Also, it sneaks in a little bit of medieval literature, with the dog being named after Charlemagne's daughter Bradamante. 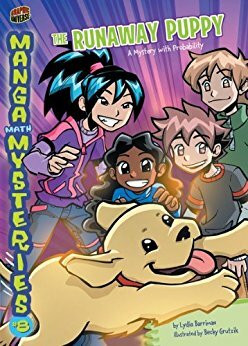 This book might not really be manga and does not feature the most thrilling narrative, but I still think it would be a good, quick read for an elementary student who is into math, kung fu, dogs, fun-looking comics, or books where kids play detective. 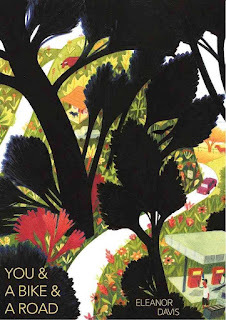 This book is a collaboration between writer Lydia Barriman and artist Becky Grutzik. According to the bio at the back of the book, Barriman is a "teacher, doctoral candidate, and writer of math courses for all ages." I could not find any additional info about her. Grutzik works on all kinds of indie comics, including the series Peep Lite and Aegis, and she shares her art and adventures via her Twitter page. I really enjoyed her work here, and her other works seem entertaining and inspired. I was not able to find much in terms of reviews for this title, but it does have a four-star rating on Goodreads. This review by Publishers Weekly of the first volume in the series seems to touch on the flavor of this volume as well. 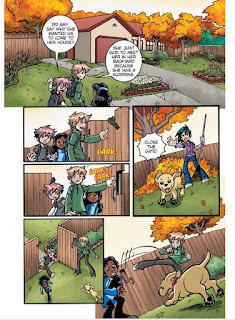 The Runaway Puppy was published by the Graphic Universe imprint of Lerner Publishing, and they have a preview more info about the book here. One Trick Pony is a great scifi story about a planet Earth overrun by aliens called Pipers who have literally consumed all the technology they could and killed most of humanity. The people left have returned to a brutal, desperate way of life reminiscent of the Stone Age (not the happy kind like the Flintstones had). The survivors have to struggle to survive the elements, the Pipers, and each other. Many of them have turned into bands of folk called Ferals, so named for their ferocious treatment of any outsiders. The main story here follows a young woman named Strata who has happened upon a robot horse named Kleidi in an abandoned cave. Somehow drawn to it, she refuses to leave it behind even though it is a magnet for alien attention. Still, it comes in handy when the Pipers do arrive, because not only is it fast enough to escape them, it also accepts commands that help it fight off the seemingly invincible aliens. Strata's harrowing journey drags in a couple of her compatriots as well as a fugitive from the Ferals as they try to stay ahead of the advancing Pipers. Together, they cross lots of terrain and also delve into the mysterious origins and actions of the Pipers themselves. The aliens are called Pipers because of the sounds they make as they float about and blow toxic bubbles that swallow up technology and maim any living thing in their path. One of the survivors makes a link between their name and the legend of the Pied Piper, which gives the whole enterprise a mythic feel. Overall, I was very satisfied with this book. The artwork is exciting and gorgeous to behold. 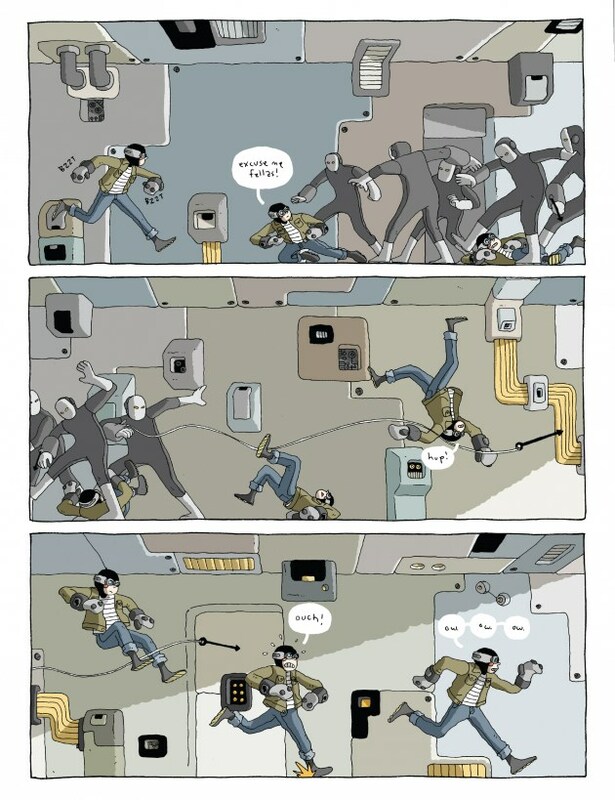 And the story features a mix of science fiction, action, character development, humor, and existentialism. The book ended in a pretty open-ended manner, too, and I would be very happy to see a sequel to find out what sorts out from the aftermath here. 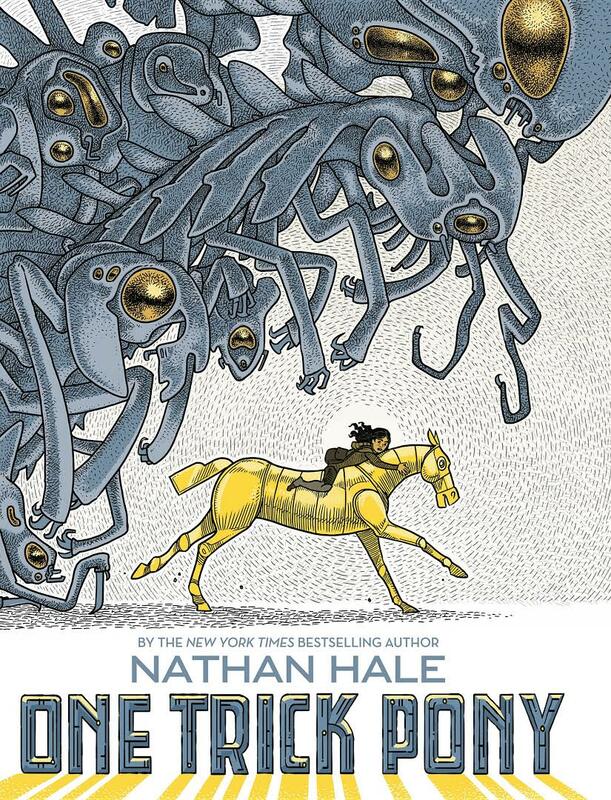 This book's creator is the prolific Nathan Hale, one of my favorite comics creators, and I am not shocked that he was able to pull off combining as many elements in this book as he has. 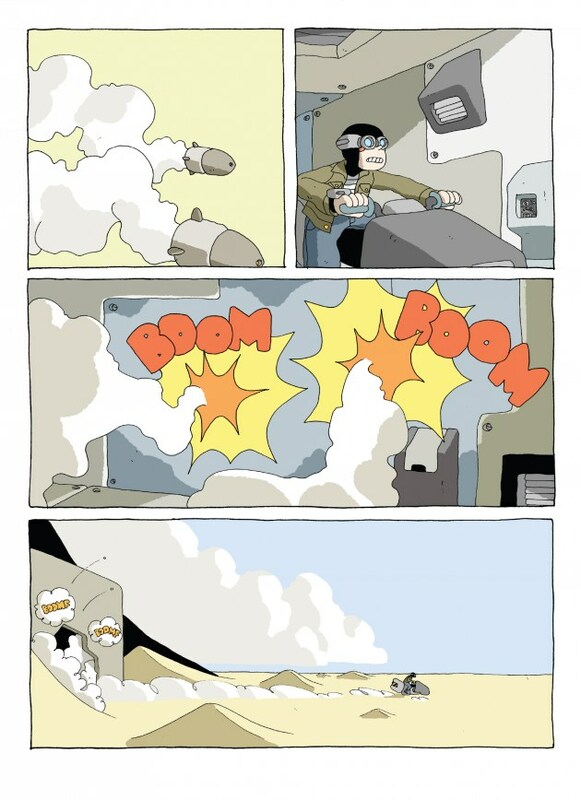 He is a masterful comics artist, best known (and celebrated) for his nonfiction series of Nathan Hale's Hazardous Tales, which I practically consider required reading if you like graphic novels and/or US history. 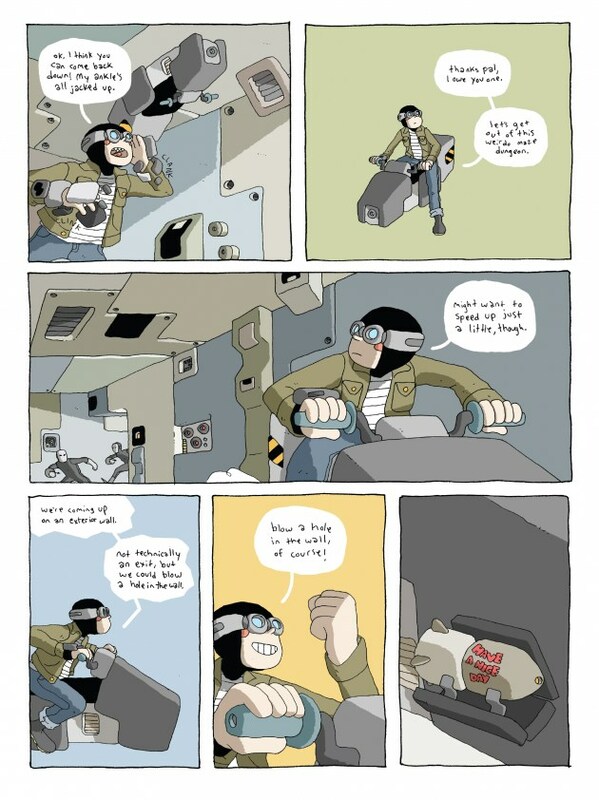 He also has drawn two other graphic novels, Rapunzel's Revenge and its sequel Calamity Jack. He has also worked on a variety of children's books, including Frankenstein: A Monstrous Parody and The Dinosaurs' Night Before Christmas. All the reviews of this book I have read sing its praises. Publishers Weekly concluded, "Hale gives his post-apocalyptic scenario special sauce, and readers will hope for more." Elizabeth Bird explained, "Even if you’ve never cared for science fiction, and even if aliens normally bore you to tears, you’ll find something to love about this book." 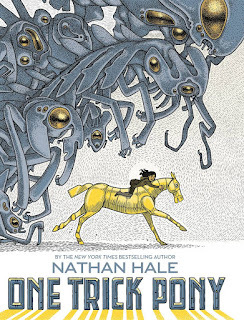 Kirkus Reviews summed up, "Hale blends adventure, aliens, an apocalyptic future, and folklore into an easy-to-read stand-alone"
One Trick Pony was published by Amulet Books, and they have a preview and more available here. Night Air was one of my favorite books of 2016, and this book Volcano Trash is the follow-up volume from Ben Sears. In this book, we get more of the same: excellent all-ages adventure starring a couple of lovable rogues named Plus Man (a young goggle-wearing thief) and Hank (his robot companion). They are also joined by a getaway driver named Basil, who pitches in on various plots and schemes. The characters have much to contend with in this book, including corrupt cops, a labyrinthine prison, lackeys, a henchman who can split into three, and hive-mind guards, when their past actions catch up to them and they end up in the hands of the law. There are lots of action, intrigue, and plot twists, too, as unlikely alliances happen and certain characters are not what they seem. In addition to all of this great plotting, you can also see that the artwork is exceptionally attractive and inventive. 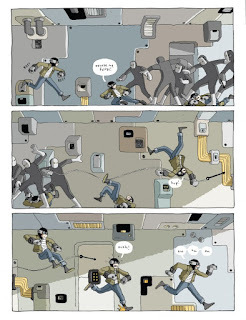 The action sequences are rendered in excellent detail, combining elements of video games, European comics, and manga conventions. The technology and character designs are first-rate, and this book is a joy to read, behold, and revisit. It's just plain fun. The reviews I have read about this book have been glowing. Dustin Cabeal simply stated. "I loved every corner and page of this comic." Oliver Sava wrote, "Sears’ work reads like a mashup of great all-ages entertainment like Tintin, Adventure Time, the Indiana Jones movies, and any number of action video games, and there’s a sense of joy and delight that makes his comics especially well-suited for kids." Paul and Gwen at the Comics Alternative praised the book for its broad appeal and unique art style. 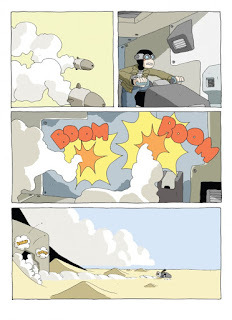 Volcano Trash was published by Koyama Press, and they have a preview and more info about it here. If you are interested in learning more about Ben Sears, there is an extensive interview with him about comics and this book here. I definitely would not expect to find much provocative social commentary or satire from a book based on licensed characters. 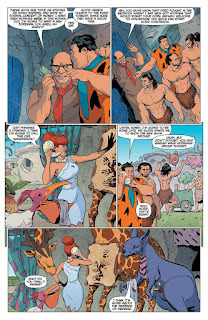 Those types of comics are usually insipid knock-offs of more vital media versions, but this Flintstones comic is actually very insightful, fun, and way more well done than I would have expected. This volume collects the first six issues of the ongoing series, which is about to be at issue #12 at this writing. Instead of it being a watered-down version of The Honeymooners, this series casts the family in a more realistic, bittersweet light. Fred is a war veteran stuck in a low-end job, always trying to advance but always getting taken advantage of. Wilma is a stay-at-home mom with artistic tendencies, and Pebbles is a young adolescent with a keen eye and sharp tongue. Over the course of this series, they deal with many social issues and situations that mirror and comment on our contemporary ones, turning them on their heads in humorous and satirical fashion. For instance, both the Flintstones and the Rubbles catch flack for having nontraditional marriages (they are monogamous, whereas the norm is to be polygamous). They deal with vacuous politicians who offer no solutions other than blunt, brute-force tactics to deal with enemies (i.e, anyone who seems weird or foreign to them). They go to church and find a wide array of objects and deities offered for worship. And they are invaded by alien teenagers looking for a thrill during spring break. Perhaps the darkest and most troubling aspect of the book has to deal with capitalism and consumerism, where people are constantly being pushed to buy household products that they may not need, just to keep up appearances. Many of these items and appliances are actually living things that have personalities and can communicate, though they are ignored and treated like objects. When their people are not around they talk to each other and loosen up some, though they accept their lots in life and do not rebel. A common theme in this book is that pretty much everyone's happiness in this book is built on somebody else's misery. And a dark edge tinges pretty much every funny thing in this book, from the origins of Bedrock itself, to the way Barney and Betty Rubble adopt their son Bamm-Bamm, to the presence of the prototypical homosexual couple Adam and Steve. The satire is more pointed than shocking, but what is actually shocking is how admirable and satisfying this series is. Many comics today take a "grim & gritty" take on previously light material in ham-handed and oblivious ways. This book has a lot of heart, depicting very human characters with a complex blend of humor and pathos. Much of what makes it work is the combination of clever plotting plus the character designs that mesh together a version of realism with cartoon elements to make for some impressive, expressive scenes. 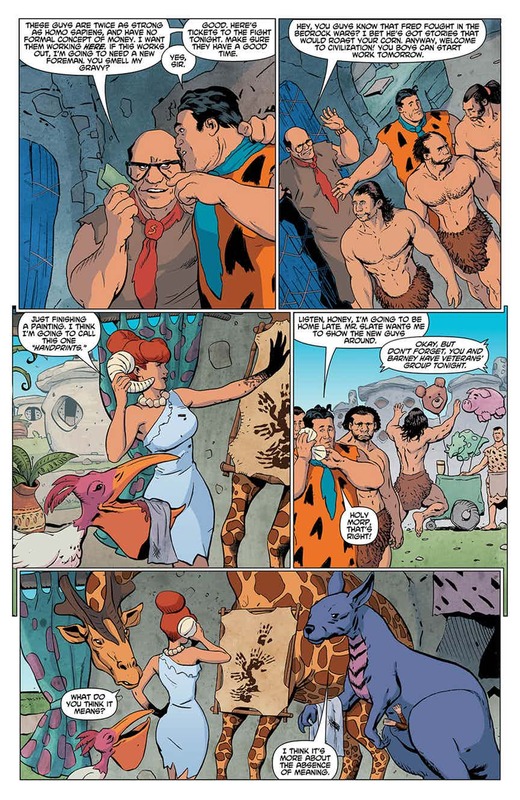 Never in a million years would I expect to be reviewing a Flintstones comic here, but this one is a surprising gem. This series is a collaboration between writer Mark Russell and artist Steve Pugh. 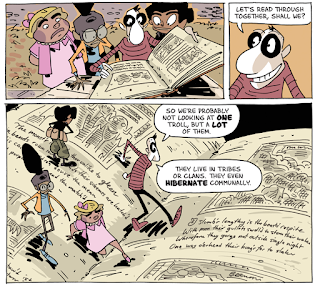 Russell has collaborated on a few notable comics and comics-related books, including the profane and funny God Is Disappointed in You and a contemporary reboot of Prez. Pugh has been active in comics for decades, and his most notable works in the US have been multiple runs on Animal Man and drawing the Saint of Killers mini-series. Both creators speak about their work on this series in this interview. All of the reviews I have read about this book have been positive. 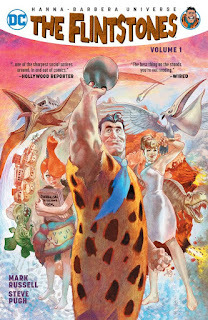 Publishers Weekly gave it a starred review and summed up, "Broad satire like this can risk a level of smarminess, but this is avoided through some sweet characterizations that present Fred and Barney as lovable lunkheads whose sincerity often sets them apart from the rest of Stone Age society." Ken Petti wrote that it was full of "solid stories with real emotional punch." Jacob Brogan commented about the various satires and that "what emerges is a story about the profound fragility of civilization—but also about the unlikely durability of the human connections that make it up." 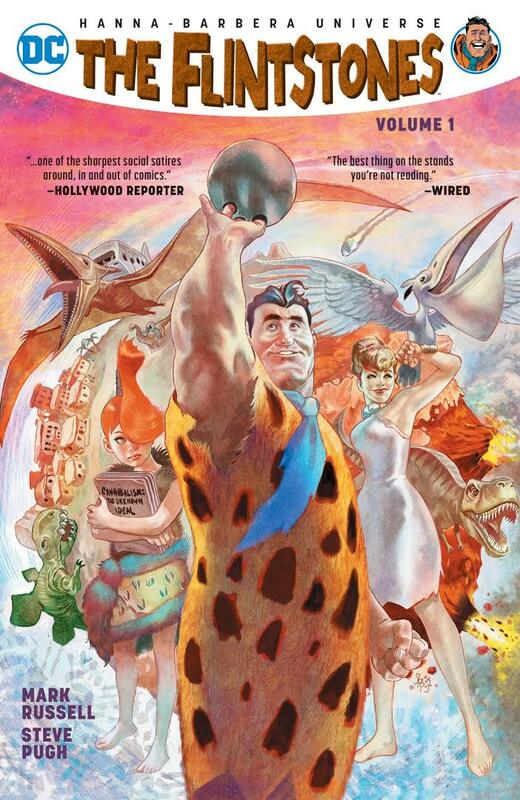 The Flintstones, Volume 1 was published by DC Comics, and they have more info about the series here. 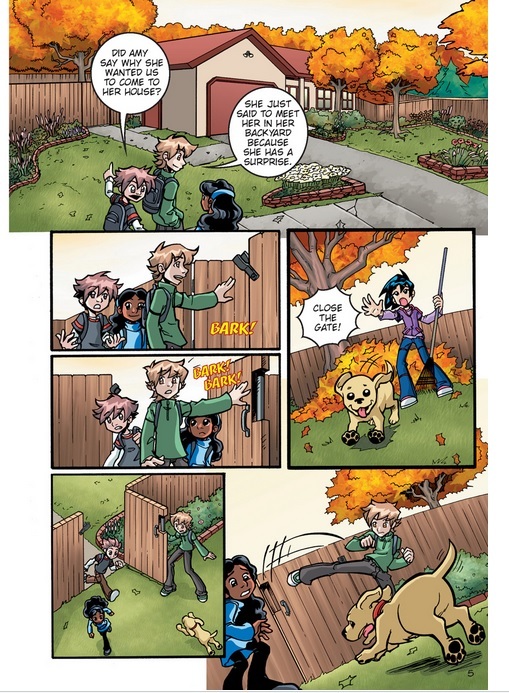 The Creeps is a series of books about a group of four misfits/monster hunters/detectives who just can't seem to catch a break in their school or town. They live in a community beset by horrible creatures, where people are routinely hounded or eaten by strange beasts, and they are only further ostracized when they try to help. Still, I feel that their bad luck and treatment make for some very compelling stories and relatable characters (who does not love an underdog?). 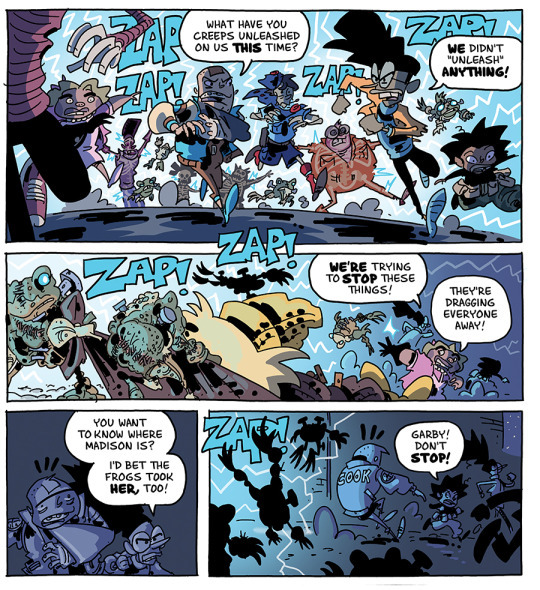 In their first book, Night of the Frankenfrogs, they have to contend with creatures cobbled together from critters stolen from their biology class. Their inquiries lead them into all kinds of interesting, icky places, like sewers and the lair of dethroned and bitter science fair champion. The case goes in many directions, and I have to say that the solution makes sense, but I did not see it coming. 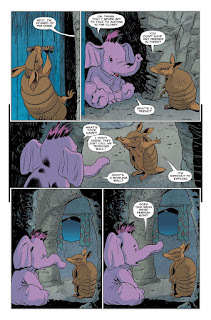 I also liked that the characters here are firmly established in their town, making all kinds of references to past cases and beasts they have dealt with. This world is a rich one to tell stories in. The reviews I have read about this book have been mostly positive. Esther Keller wrote, "This will be a definite hit with middle grade readers." 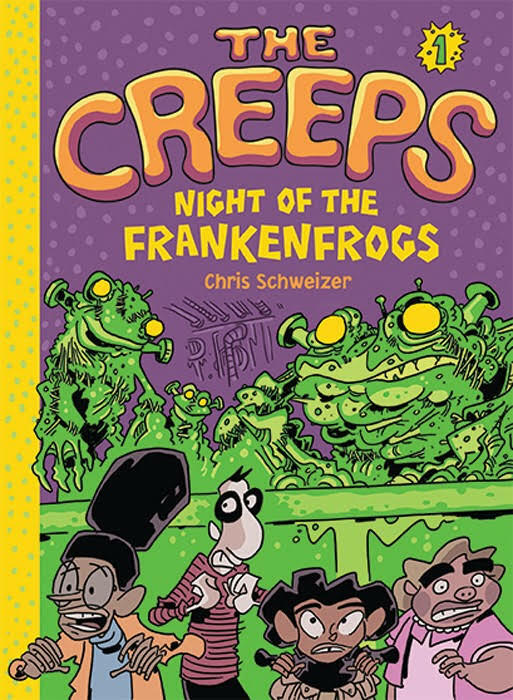 Kirkus Reviews commented that "Schweizer's cleanly paneled art is bright and busy, ever ready with a gag that helps blend the ghastly with the goofy, making his gang’s antics reminiscent of Scooby Doo." Robert Greenberger was cooler on the book, noting, "The dialogue is interesting but his characters feel not fully realized and it could be Schweizer’s working with too large a cast and too big a story for a first offering." The Trolls Will Feast! 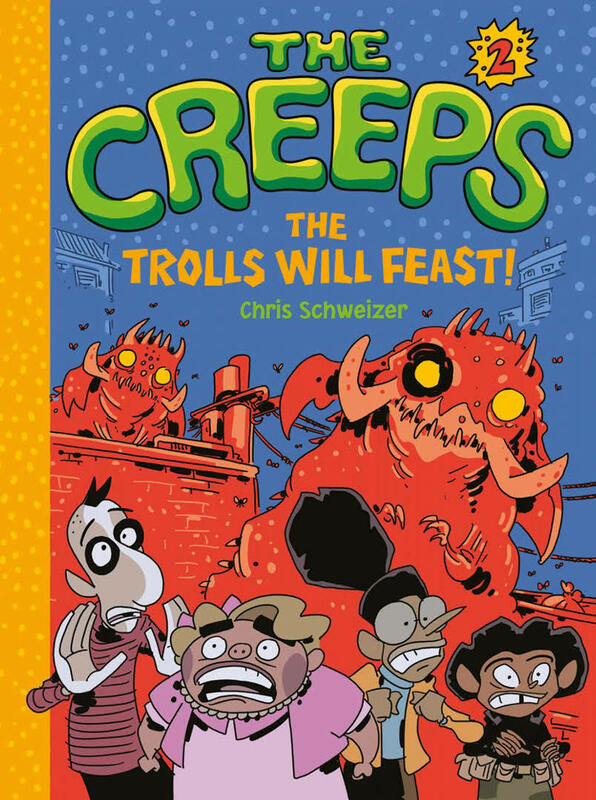 is the second The Creeps book, and I hate to say it, but this is the book that actually brought this series to my attention. It is nominated for a 2017 Eisner Award for Best Publication for Early Readers (up to age 8), a fact I find a bit puzzling. Not the nomination, as I feel that Chris Schweizer is a very talented and deserving comics creator whose past works (like the Crogan's Adventures) I have loved. But this book feels like it is aimed at an older audience than 8-year-olds. I feel it's more a middle school or young adult-type book. Still, I did not even know these books existed until I saw this nomination, so I am glad for Schweizer and also to have found them. The second book ramps up the excitement, humor, and intrigue, focusing on the mysterious disappearance of some of the Creeps' classmates (who get eaten by trolls at the very beginning of the book, one of the factors that leads me to think this book series may be more for older elementary or middle school readers). The trolls, it turns out are an ancient race who periodically feast on humans, and their methods for preparing their meals are pretty diabolical. This book's plot I found more intricate and tightly woven together than in the first book, and I marvel at how many gags, jokes, and details get crammed into every page. I found both highly enjoyable and entertaining, and I am very much looking forward to reading volume three. I also hope to see more books in the series, as I can find no mention of a book 4 as of yet. The reviews of this second volume were stronger than for the first, with much praise heaped on it. Kirkus Reviews summed it up as "a satisfying and rollicking sophomore offering that improves on the first." Robert Greenberger concluded, "This is a stronger offering and shows greater command of the characters and their setting so the series is taking on a nice shape." Kat Kan wrote that it "will appeal to a wide range of young readers hungry for horror-lite monster stories." For those interested in his works, Schweizer tweets here and also blogs here and here. He speaks about his work on The Creeps books in this interview and also in this interview. Both of these The Creeps books were published by Amulet Press, and they have previews and more information about them here and here.